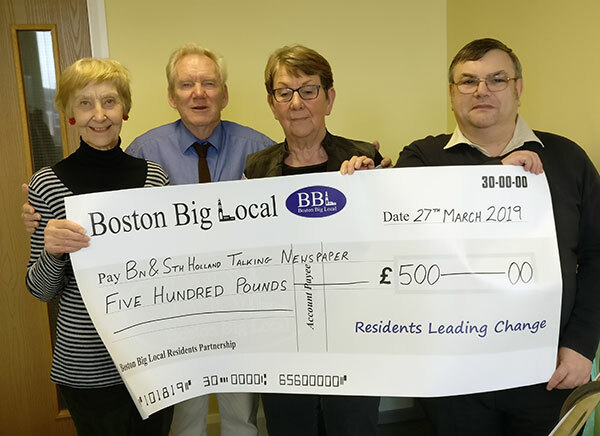 Back in November, the BBL Community Chest Panel gave Boston & South Holland Talking Newspaper £500 to purchase new audio players and batteries. Yesterday we went to see the great work the volunteers do to support people without sight in our area. We also used to opportunity to present our standard oversized cheque. Below is the half-year report from Boston & South Holland Talking Newspaper to share how the £500 has helped them provide their service. Our aim continues to be providing a free audio service to visually impaired people around our area. A handful who used to live locally have moved outside of it but still like to hear our local news. We have recently lost some to natural causes – with a small cluster of 4 within a week or so of each other in February/March this year. Of those 3 were in their nineties. We currently have 113 listeners (4 pending). We provide a service indiscriminately of postcode to the eligible. Referrals come from – South Lincs B.S., the Sensory Service, the Macular Chair – the RNIB contact based at Pilgrim. We still have 9 Listeners in postcodes PE21 – 8 & PE21 -6. I attach a copy (redacted) email sent to me recently by the daughter of a lady who has recently passed away. Over the last year we lost 3 volunteers due to ill health but new people have joined us. We currently have 20 volunteers. We were very pleased to receive the £500 grant, which covered the cost of 6 new players and spare batteries. We cannot always retrieve players from family. Occasionally players come back without batteries. The bill was £294+ the balance will be allocated again other overheads. Our accommodation in the LMVC is small but adequate – wallets are dealt with on a Wednesday and recording and copying on a Thursday morning continuing into early afternoon. Our volunteers really appreciate decent accommodation, which is well managed, warm, no steep stairs to navigate and a convenient location. Rent will once again rise by up to 5% plus VAT for the financial year April 2019 to March 2020. Very few volunteers claim expense – so the contribution beyond their time is quite substantial, especially the editors who buy 4 local papers on their editing weeks. Sufficient demand from sight impaired people for the service. Availability of news in any local press. No Comments to "£500 for Boston & South Holland Talking Newspaper"